SEIB: Welcome, everybody. Welcome to today’s Council on Foreign Relations meeting with U.S. Secretary of Homeland Security Kirstjen Nielsen. SEIB: I’m Jerry Seib, Washington—executive Washington editor of The Wall Street Journal. I’m the moderator today, and I’ll be presiding. You know, the topic of today’s conversation, as we agreed initially, is Cybersecurity and Safeguarding U.S. Elections, which we’ll talk about because it’s very timely and, as we were just discussing, of broad significance around the country. There are some other issues. Border issues probably will come up. But we’ll have plenty of time in the audience Q&A to deal with issues beyond cybersecurity and elections. But again, thank you for being here. Let’s talk about elections, because we are, as we speak, four days from what I think is a very charged, high-stakes election. Can Americans be confident their votes will count, that the system will hold, that there won’t be interference, and that there won’t be problems on Election Day? NIELSEN: First of all, I would just say we actually have an even higher bar. NIELSEN: So we want to make sure that everyone’s vote is counted, but is also counted correctly. So, as many of you know, there were concerns that proved unfounded. But as we see throughout the rest of the world with some of the attempts to hack the election infrastructure, there’s also a concern about the integrity. So we want the vote to count. We want it counted correctly. What I can tell you is this is going to be the most secure election we’ve ever had. But as we all know, with this dynamic threat, it changes by the minute. So as of today, we don’t have any indication that a foreign government has a sustained effort or a sustained plan to hack our election infrastructure. But, having said that, the moment it changes, we, of course, will let our state and local partners know. SEIB: So you have said that the Russians probably attempted in 2016 to gain access to the voting systems in all fifty states. SEIB: And they were, in fact, successful in a couple of cases. What are they doing now? And what did you learn from that 2016 experience? NIELSEN: Yeah. So I think there’s—if I could, let me just back up and divide it into a couple of different threats. So the threat that DHS focuses on is any interference into the election infrastructure. So we work with our state and local partners, election officials, Elections Assistance Commission. I can go into a variety of other groups that we work with. But what we’re trying to make sure is that that infrastructure, the voter databases, the polling infrastructure, the voting machines are all secure. The other threat, though, that we’re facing, which is much more difficult to get our hands around, is the very pernicious attempts at foreign influence by foreign governments, and this takes a variety of means. FBI has lead on that. That’s much more difficult. A lot of that, at the end of the day, is about educating the American public to think about what you are reading, think about the source, think about where it’s coming from. RT, as you know—which is a self-proclaimed state agent of Russia—if you can believe it, in 2017 had more views on YouTube than CNN—double the—double the amount of views. But that is a directly state-sponsored news agency. So that is much more difficult to combat, and that’s China, that’s Russia. We see that with Iran, we see the recent takedowns from Facebook. So that’s the FBI lead we support. I think we need to continue as a country to figure out how to combat that part. But the election infrastructure—we’ve done a tremendous amount at the front end of training and then all the way through to Election Day where we’ll have a war room set up. SEIB: So I want to talk about Election Day and election night in a bit but, you know, there was an indictment this summer of a couple of Russians, cyber activists who are affiliated with the Russian military, and that indictment said there was personal data from half a million voters hacked in 2016, probably—I’m assuming it’s Illinois; Illinois thinks that’s the state that was referred to. So that was an illustration you’ve got of voter data, and you’ve got actual voting systems, and they are not the same thing, which is probably not well understood. Which is more vulnerable, and can you protect both at the same time? NIELSEN: So many of the vulnerabilities or the ways in which you might attack the systems are very similar, and we see that across infrastructures. So, as many of you know, DHS has lead for security and resilience for all sixteen critical infrastructure sectors in our country, and many of these tactics and techniques are the same. What I would say about the voter databases is that there is a lot of redundancy built in there. Every state gives you the right to vote on a provisional ballot. Those that don’t allow you to do same-day registration to vote. So if there is any reason why an American should show up to a voting place and be told they are not on the rolls, they could still vote, and then we’ll determine if there was an issue. And sometimes those issues are operability issues. We’ve seen some data glitches in some of the states that are nothing to do with security per se, but that’s why we have provisional ballots. So there is some redundancy built in there. On the election systems themselves, what I would say is they are so very decentralized, right, so the good news is that this is not a situation where we have any indication the capability exists to, at one time, if you will, take down the voting infrastructure throughout the nation. The systems just aren’t connected in that way. It would have to be a very different level of attack and capability that we’ve seen. But we have seen the will, we have seen the capability to disrupt, and so that’s what we continue to work on. SEIB: So let me try to be a little more clear here. As we speak today, have you seen attempts to hack into either voter databases in any of the fifty states or into the actual apparatus of casting and counting votes in any of the 50 states? NIELSEN: So what we’ve seen is continued attempts to scan—you know, to access the systems. You know, that’s kind of like a burglar, you know, walking around your house and trying your windows. In some very limited cases, we have seen access, but they have been quickly prevented or mitigated. NIELSEN: But not that we can attribute to a foreign country, so this is the general—you know, if you talk to a bank or you talk to somebody in the energy infrastructure, we are under constant attack, and I can’t stress that enough. So what would be strange is if we didn’t see any attempts. And again, remember how the systems work. If you have an election site on your government—e-government site, there could be lots of reasons why people are trying to access that. They could just be trying to steal, for example, people’s utility information or Social Security numbers, which we also work on, but might not be related to the election. As of today, we do not have any activity that we are attributing on the election infrastructure to a foreign entity. But again, that can change in an hour, so it’s very dynamic, and we’re continuing to watch. SEIB: So the president made some waves here in New York a few weeks ago when he said he is worried about Chinese interference in the 2018 midterm elections. What was he referring to? NIELSEN: The same thing—so the Chinese have a very sustained, persistent campaign, through foreign influence techniques to change the way in which Americans think about China, and particularly to change our policies with respect to China. And we see that in a lot of ways. We see that in their news, but we also see that through the purchase of businesses. We see that through the co-opting of officials throughout the world. We’ve seen them very active in investment schemes—because that’s what it is—in different parts of the world where then that country is beholden for decades of debt. So there’s a very prolonged attempt, but I would say the difference between the Chinese and the Russians, the Russians are much more brazen. They are much noisier about this, and they want to affect something here and now to disrupt American democracy and to give them an edge. The Chinese are playing a long game; they are in this for the long haul. SEIB: Well, but what you are describing is really a classic propaganda campaign as opposed to attempts to break into and influence or gain intelligence from the voting system of the United States. Is that really what we’re talking about here? NIELSEN: Again, we haven’t seen any foreign influence attributed—I just want to keep making that clear—at the moment. But I also hesitate to give you an equivocal answer on that. We just met with our Five Eyes partners in Australia a couple of months ago. The conversation we have here about Russia they have about China. They are very concerned about China doing what Russia did in our 2016 election in their elections. So again, China has the will, they have the capability. We haven’t seen it on election infrastructure, but we have seen a very wide-ranging campaign very much targeted at the United States. SEIB: So John Bolton, the national security advisor, has also talked about attempts—or at least concerns about attempts by Iran and North Korea to also interfere in the elections. Again, what’s a reference to exactly? NIELSEN: Well, you saw—you know, you saw Facebook take down over 80 Iranian-facing accounts over the last—I think last Friday, very recently. They were not complying with the rules of Facebook. It was—inauthentic content is the phrase that Facebook used. So again, there are a lot of countries that are trying to influence how we vote, what we think, what we think about each other, how we carry on discourse, and unfortunately now we are seeing that from Iran, as well. SEIB: So you are really talking again about foreign attempts to kind of affect the atmosphere of the political conversation in this country. NIELSEN: Yes. But the issues of course are tied to, in some cases, parts of the—parts of various campaigns. If you are campaigning on a particular issue, and one of these countries attempts to affect the discourse on that particular issue, it is in some cases a clear attempt to try to manipulate the way in which voters think. So that’s the tie to the election. We’re seeing it much more aggressive leading up to the election. SEIB: —in fake personas, fake accounts, that sort of thing? NIELSEN: Fake personas, fake accounts, but what they have—I think they’ve caught on to some of our techniques. As you know, when we find a fake persona, we—the U.S. government—share it with the platforms. We have conversations with them if it violates their user rules, and they’ll pull it down. I think the nation-states have become aware of that, so what they are doing now is they will take otherwise legitimate content by a non-nation-state actor, and then they will amplify it in a way to continue that conversation. So it’s very difficult because some of this, as you know, is protected by free speech, right? This is not terrorist use of the internet. NIELSEN: But there is a question here as to whether Americans should have the right to know who is saying what and to be able to understand the context in which news or just commentary is provided. SEIB: So in your own conversations with the big tech players in this space—the Googles, the Facebooks, the Twitters—how responsive have they been to this concern, and are you looking for more than you’ve gotten from them? NIELSEN: So it could always be more, but they have been tremendous partners, and we do partner with them in a variety of areas: everything from child exploitation to terrorist use of the internet. We also have started to work with them on a variety of capabilities they have through AI and analytics to actually spot fake personas before we become aware of them. So it’s much more proactive. I think you’ve heard some of the companies say they can now pull down content right within minutes before anyone even sees it. So it’s an ongoing conversation. We have a variety of ways in which we work with them, but they have taken a lot of leadership in this area to really not only use incoming technologies to address it, but to be very aware that this is problem, and they have no interest in having fake disinformation campaigns posted on their platforms. SEIB: So let’s talk a little bit about next Tuesday, Election Day itself. Point number two, you know, FBI, through their op center has set up a way in which they’re connected to all of their field offices. They’re poised to be ready. We’ve set up a virtual war room in our National Cybersecurity and Communications Integration Center. And I’ll forget everybody that’s in it, because everybody’s in it. We have the FBI. We have all our federal partners. We have state and local election officials. We have the election assistance commission. We have the DNC. We have the RNC. We have everybody together so that as it evolves on Election Day we can all very quickly respond if instant response is required or if we need to communicate in a way to make sure that folks do understand what’s really happening. SEIB: So you mentioned earlier this bizarre characteristic about the American election system is there isn’t an American election system. There are fifty or, if you count my town, the District of Columbia, fifty-one election systems. That’s a good thing, in the sense that you can’t break into one—you can’t walk through one door and be in the whole house if you want to break into the system. On the other hand, it makes it very hard to figure out if something small has happened over here that it might be happening over there, but the person over here and the person over there don’t necessarily have a way to communicate. What have you done to fix that problem, to bring all the information together into one place, which was a concern of a lot of state officials we talked to 2016? NIELSEN: Yes. So bear with me for a second as far as the answer is bureaucratic. But we have set up all the governance structures, which we find is very, very important when it comes to critical infrastructure. Most of the critical infrastructure’s owned by the private sector. The vendors are private. Each state does elections differently. Who’s in charge of new elections can be different, based county-to-county. So we’ve set up a government coordinating council, which brings the governments together, and then a second coordinating council, which brings the private sector together. That enables them to have rule-based conversations, roles and responsibilities are clear. And then, we have worked with them to set up an information sharing and analysis center. For those of you in the room who might be in the financial sector, you’re very familiar with FS-ISAC. This is another way to do this. But through this we can share real-time machine-to-machine threat indicators. So as something happens in one area, we can quickly share that profile of threat with all of our other partners. It’s the fastest-growing ISAC. We have all fifty states. We have over thirteen hundred counties working with us. It’s a good-news story. But that allows that immediate sharing. If you see something, then everybody else has that essentially in their queue, in their sensors, and their network defense to look for as well. SEIB: And just to be clear, that didn’t exist in 2016? NIELSEN: It didn’t. None of this existed in 2016, that I’m describing. SEIB: Yeah. And so on Election Day, let’s assume that somebody in Connecticut thinks—see what they think was an attempt to break into the system by which people are casting and counting votes. That information goes where, on Election Day? And who finds out in real time that something is happening that they ought to be on the lookout for? NIELSEN: So it is a—it is a voluntary partnership. And that’s something I think—I think is well-understood at this point. But there was some confusion in 2016. There was concerns by states and locals that the federal government would somehow take over the constitutional role of states and locals to conduct elections. That’s not what we’re doing. It is a voluntary partnership. But they know exactly who to call and how to send the information in a protected manner. We receive that immediately. We assess it. And then we push it back out to all the other states to protect them. The other benefit we have now that we didn’t have in 2016, we’re pulling all of the information from the intel community. So we have very advanced not only signatures and threat indicators from the intel community, but we also have access to their analysis and understanding in a somewhat predictive way based on tactics of how an adversary might try to attack us in critical infrastructure. And that’s writ large. But we pull all that together. They sit with us. We have many, many folks now that have clearances within the community. And those who don’t, we have assured them that if we have credible, actual information, we will immediately share. I’m not going to let a clearance in that case stand in the way. We have that information. In many cases, they’re elected. But we will push out that information. We did not have the mechanisms to do that either in 2016. SEIB: Well, there’s also been some question. And, again, this is a bit of a bureaucratic question. But in Washington, there’s been some question about whether funding is adequate to allow this system to really develop, whether the states have the funding they need to secure their own systems, and whether there’s been an adequately funded national effort to wire everything together. Is there enough money in the system to do the kind of protective work you’re talking about? NIELSEN: So we’re—you know, we’re working with—states need to tell us that. They know that. They’re working through that problem set. We have an entire catalogue—that’s literally what it is—of services that we’re offering that are completely free. They can take us up on that. We’ll tailor them. We’ll work with them. But it’s everything from hygiene scanning, phishing training, through very in-depth vulnerability assessments and everything in between—exercises, awareness. But they also have, in-house in some cases, professionals who work with them. In some cases, they’ve hired firms from the network defender community, from cybersecurity. So they have to look at all of that, look at what they have, and then we’ve asked them to tell us, to communicate with us, what is it that you need? So we’ve seen some great examples, where Rhode Island, for example, has been able to budget to upgrade their system. We’ve seen other states that have taken interesting approaches where the state budget has provided a tremendous amount of resources, but then asked the counties to match that. So it’s both levels of government in on this. But we’ve also seen states like Georgia throw a flag and say, gosh, we really need to update all of our aging infrastructure. And it was sixty or eighty million (dollars) that they came up with. And they’re not able to budget for that. So what we’ve said to states is: Please, come up with the amounts that you need. What is that you need? And we will help you work with Congress to make sure. SEIB: Which means what? What’s an auditable system? NIELSEN: An auditable system means that when you vote we have a way to go back after the fact to ensure that all votes were counted and were counted correctly. There’s a variety of different ways to do that. One is just paper ballots. So some states have gone back to paper ballots. It’s, you know, old-school, but you can count them. It’s a piece of paper with your vote on it. And we can double check that the count is correct. Others are technology. So there are some machines where as you vote you can choose to essentially—it’s almost like a lever that you pull—and it spits out a paper copy of your vote. You can then have access to that, and you can also give that to your polling place. That also enables all of us to then verify that. Many, many states have moved towards some sense of an auditable system, but there are still some counties and some states that don’t have that. SEIB: Should there be a national standard, a national system? SEIB: Yeah. And are states receptive to that? NIELSEN: They are. So we—and, actually, they’ve been very helpful. We also have a last mile initiative. We’ve worked with the states to get to that part you mentioned earlier, which is some of the much smaller counties are very unlikely to be resourced. So we’ve worked with states to go county-by-county and help them with an assessment on what additional activities or resources they could provide to get everybody up to speed. SEIB: So I want to turn to the members for questions. But let me ask one last broader question. When you step back from all this, and you think about, in particular, the foreign actors we’ve been talking about—Russia, China, Iran, North Korea—there are a lot of pernicious aspects to their meddling. One is that people lose confidence in the system. One is that they don’t trust the results. One is that they simply don’t show up to vote because they fear their vote isn’t going to count. What is your biggest concern when you think about foreign actors attempting to interfere in the election system? What’s the most pernicious thing you worry about? SEIB: Just put one at the end. NIELSEN: That’s right. So there’s more educating that we need to do on the importance of strong passwords. My biggest concern is that a foreign entity will take the opportunity after the election, the night of the election, to attempt to sow discord through social media by suggesting that something did not work as it should in a particular area. And no that, we’ve met. We’ve done exercises. We’ve done calls involving news agencies—anybody reporting election results. We did an exercise last Friday to help them understand: These are the legitimate ways in which you can receive official results. If you get an email from someone claiming to be an election official, understand you want to get the results out as quickly as possible, but please refrain because we cannot verify that email real time for you, that it comes from an election official. So use the predesignated ways in which you should receive and report. And, of course, they’ll also be with us in (the room ? ), so if you have any questions real time, we can work through that. But I think we have to not jump to conclusions as Americans. Again, there are operability issues. We saw one state recently, with the way their machines worked pre-voting, if you didn’t give it enough time to load and you tried to get through your voting very quickly and click and you wanted to do an all-party option, it wasn’t really allowing you to do that. That wasn’t a cybersecurity issue. It was just an operability issue. So we just need to pause, I think, election night and not jump to conclusions. SEIB: And the goal here, if you’re a foreign actor, is to sow discord in the United States or to undermine the whole idea of democracy, generally speaking? NIELSEN: I honestly think it’s all of the above. We definitely see it on the discord. We have seen them, interestingly, put material online that represents both ends of any particular issue, the full scheme, the full—they’re not necessarily focused on getting you to believe X. It’s should you believe X or should you believe Y? And if you kind of believe X, I’m going to get this—you get my point. But in terms of the democracy, I mean, 2016 showed us they absolutely were willing to attack the very essence of what makes our country a country, which is the sacredness of our elections. So I do think it’s both. SEIB: With that, let me open the floor. Just a couple of reminders for the members here. This is on the record. Wait for a microphone. There’ll be some moving around. State your name and your affiliation. And please make it a question, singular. So we’ll start right there. Q: Thank you. Ann Cooper, Columbia Journalism School. You’ve been talking about foreign threats. The president has spoken a lot about what he considers to be a domestic threat, which is the press in this country. And I wanted to ask if you share his view that he’s stated that the press is the enemy of the people. NIELSEN: So first let me start by saying the remark that I saw him use was fake news is the enemy. There is something to be said. None of us want to read something that’s not true. I think relationships with the press are very important. I tend to seek opportunities to engage with them. I can tell you, from the DHS portfolio, with twenty-three different agencies and over two hundred and forty thousand employees, we do a lot, and it’s not well understood. I really value the relationship with the press to help us get information out. Certainly, in disaster response, the press plays an extraordinarily important role helping us to save lives; should we ever have an attack. But even when we saw with the bomber and the shooter, the role that the press played was extraordinarily helpful from our perspective. So I actually think that it’s a very useful relationship from a DHS mission perspective and one that I try to be thankful for and also find other ways to help get messages out. SEIB: Why don’t we go here and then here. Q: Thank you. David Shuman, Northwoods Capital. Could you talk a little bit about the domestic terrorism threat and how DHS is configured to attack it, how many intelligence analysts you have working on the domestic intelligence threat? NIELSEN: Sure. So one of the things that we did at DHS was we broadened our concept, first of all, of what that means. So from my perspective, hate is hate. Violence is violence. It has no place in the United States. So we’ve expanded our office to focus on preventing all forms of violence in the United States that are motivated by terrorists. But it’s not even just terrorists. It’s—you know, we look at white supremacists. We look at any ideology that lends itself or results in an extreme violent behavior. We have all of DHS focused on that. So we work with FBI. We work with our Joint Terrorism Task Forces that FBI runs, as you know. We work through the fusion centers to push that information out. And we have very close relationships with state and local law enforcement and Homeland Security advisers. The internet has really made the space for us quite difficult, because at a moment like this, a terrorist or somebody who would seek to do an American harm worlds away can, in a matter of seconds, inspire somebody in the United States to commit an act. So we work on that. That’s a very different type of threat than what we saw, for example, 9/11. It’s very decentralized. It’s much more difficult to attack. A lot of it’s on the dark web. So we have a lot of capabilities we’re building within the department to address it from that perspective. But I think the only way that we win against this type of threats is by being holistic, comprehensive, and recognizing that violence is violence, and we can’t stand for it. SEIB: Here and then here. Q: Hi, I’m Paul Steiger from ProPublica. The president has talked about mobilizing the army to protect the border. He’s talked about five thousand troops, you know, maybe more. Do you need the Army? I mean, aren’t you in a position to secure the border against a march by a couple of thousand people? NIELSEN: So two things. One is the timing of the number of people. We’re all—I think everyone in the country is watching it to one extent or another. If they get on a train or they get on buses, they’ll be here in a matter of days. If they stay on foot, they’ll be here, you know, in a month or so. So first we just have a capacity issue. When we’re talking about those numbers, either coming to a port of entry or trying to come between our ports of entry, no, we do not have the capacity and capability to address that type of a flow. So what we’ve asked DOD to do is support us with engineering, support us with logistics, with planning; and then, as a second phase, to help make sure that we can defend our ports of entry. And that is because of what we’ve seen particularly in that second and third phase of the flows in Mexico that unfortunately did turn quite violent. But by the time we’re talking about Molotov cocktails and the use of firearms, it’s my duty to ensure that our officers and agents are secure. I would also note that part of our mission at DHS is to facilitate legal trade and travel. We do not want that legal trade and travel to be put at risk in any way by a mass flow of people. So it’s a capacity building, capability building, to ensure that we can continue to execute our mission. SEIB: Right here and then there. Q: Nina Gardner, professor of business and human rights at Johns Hopkins SAIS in Washington. I wanted to ask you about family separations. And what were you thinking when you announced that policy without having a tracking system? I think our luggage at airports are taken care of more, with more respect, than the children that were separated. So I was wondering, what are you doing to reunify the children with their families now? And how do you stay up at night? NIELSEN: Well, thank you for the—(laughs)—way in which your question was asked. I would say that at DHS we enforce the law. And unfortunately some parents chose to break the law and enter the country in a way that did not go to port of entry. We do have a tracking system. We take very good care of the children that come into our care. The part that I really worry about is last year we had seventy thousand children dropped off at the border by smugglers and traffickers, whose parents decided to send them alone on an extraordinarily dangerous journey. So we have about thirteen thousand of those who are in HHS care right now. The tracking that we had, we used to ensure that families can be reunified if they do not have the ability to stay in the United States, so they can be reunited when they are removed. HHS has a tracking system to ensure that they quickly, and as fast as possible, reunite children with families or with sponsors in the United States, which, as you know, is what TVPRA requires. In terms of reuniting on the back end, most all of the children have been reunited with families. The ones who have not—you know, we found about eighty percent of parents have now chosen for the third time that they do not want to be reunited with their children. And so those children remain in HHS care. And so HHS is trying to find safe sponsors for them and to give them good care. When I talk to my partners in Guatemala, Honduras, El Salvador, and Mexico—and I’ve called a couple of ministerials over the past couple of months; they just came into town for a big conference—we’ve really talked about, you know, how do we look at this regionally? The goal of all of us should be to protect vulnerable populations, should be to have a system that enables us to keep families together, and should be able to ensure a safe and orderly process so that these vulnerable populations are helped as soon as possible. The journey, as you know, is tremendously difficult and dangerous. We have about thirty percent of women who take that journey sexually abused, seventeen percent of men—seventy percent of the migrants are victims of violence. So when I meet with UNHCR—I met with the high commissioner again yesterday—I’ve asked them for—since the whole time I have been secretary, let’s expand the asylum capacity throughout the region so that we can help them as soon as possible on that journey so that they’re not forced to make decisions such as using a smuggler, using a trafficker, sending kids alone to the border. So it’s a work in progress. I’m hopeful that the partnership will continue to grow. We’ve had very pointed conversations on how to address that. But, you know, our laws are difficult. We do need to, and we’ve asked Congress, to change the laws so that we can keep families who choose to come here, however they come here—whether it’s illegally or legally—that we can keep them together while we process their claim. SEIB: Here, and then we’ll go back there. Q: Hi. I’m David Gruppo. Q: But that they haven’t succeeded, right? And so the question is, does that then mean that your position is that the Russian state doesn’t have sufficient technical skills to hack into, say, the Louisiana voting system or a parish of Louisiana? Is that—is that your—is that what you’re having us believe? NIELSEN: No. Actually, what I said is that nation-states have demonstrated both the will and the capability to attempt to disrupt or deny our election infrastructure. That is point number one. So if I sit here today and I don’t have any intel or any information from the state and locals that they are under some sort of scanning that we can attribute to foreign countries, what I’m actually saying is don’t let that mean anything other than what that means as a moment in time. We know they have the will. We know they have the capability. We need to continue to be prepared and think about resilience and redundancy in the system. SEIB: Right there, and then her next. Q: Thank you, Madam Secretary, for spending time with us this morning. Mark Hannah with the Eurasia Group Foundation. I appreciate what you said about seventy percent of the people coming up having been victims of violence. Listening to the president’s remarks last night, a reasonable person could infer that seventy percent were perpetrators of violence. The wave of immigration coming north has been called an invasion. A logical consequence of an invasion, or a violent invasion, would be an armed response. Do you agree that it’s an invasion that’s coming north? And when the president says we’re going to treat people with rocks as though they had rifles, that caught many in the military off guard. What do you think that does to recruiting the new generation for military service when comments like that are made? NIELSEN: So taking the first part, you know, to put it in perspective, we are apprehending about 1,500 to 2,000 illegal entrances a day. So just to put it in perspective, that’s a daily number. The challenge with the caravan is it’s a very amorphous concept. You don’t get a ticket to the caravan. There’s not a membership program. So what we’re seeing are migrants who are potentially already on the flow choose to be in the caravan, not choose to be in the caravan. You’ve seen numbers reported by the press as high as 15,000. I don’t think the number is that high based on our conversations with our partners in the region. But I think what’s difficult about this flow or different about this flow, as you’ve seen talked about from everyone from President Hernández through to Secretary Navarrete in Mexico, who’s my counterpart—one of my counterparts—is that that second and third flow are proving to be quite violent. They are covering their faces. They are, you know, attacking the federal police there, attacking the military in Mexico. They’re putting the migrants who are in the caravan who are seeking asylum at risk. So we’re trying to work with the Mexicans to protect those who are legitimately seeking asylum, to make sure that they have a way to do that as soon as possible. As you know, Mexico has offered asylum to everybody traveling north right now. We all, together, are encouraging migrants to take advantage of that for their own safety. But we’ve also seen criminals in this flow. We have seen gang members. When I met with my counterparts in one of the countries in the region recently, they were very concerned because they had missing children. There were kidnappings under a false belief that if you had a child you would be able to come into the United States and stay. So, in general, mass migrations are dangerous for the migrants themselves. It needs to be safe. It needs to be orderly. That’s the best way that we can protect them. And again, the system is broken, and we’re requiring somebody who’s seeking asylum to travel seven weeks through a very, very difficult process, usually at the hands of smugglers. So we’re working with UNHCR, working with the region to try to make sure that we can help those populations much sooner. SEIB: Right here, and then back there. Q: Good morning. Thanks for being here. I’m Nili Gilbert from Matarin Capital. I wonder, how do you see the U.S. electorate and the major pressures on our country thirty or forty years from now? And if you had to build a long-term strategic plan for the Republican Party, how would it respond to those pressures? And how is the party moving towards that today? 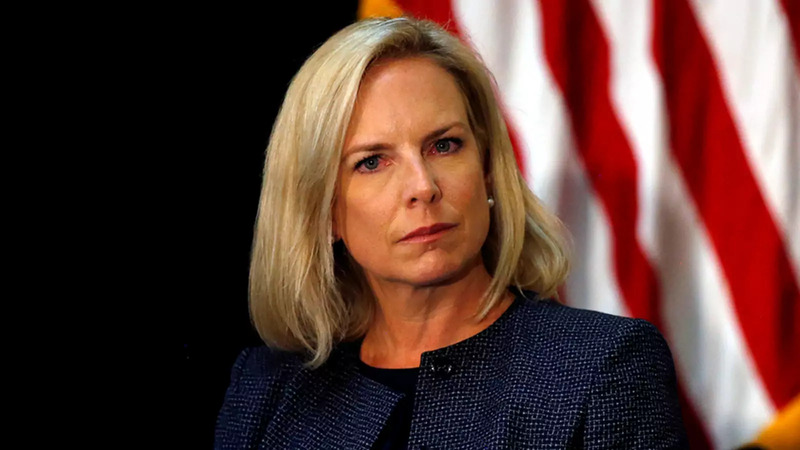 NIELSEN: So the one good news is that despite the myriad of missions that we have at DHS, I do not have to do that one. (Laughter.) So I would respectfully just refer you to the RNC. We don’t—national security is bipartisan. Homeland security is bipartisan. I don’t get into the politics of it. We’re just trying to secure the homeland. So, respectfully, I wouldn’t have any comment on that. What I can tell you is from a homeland security perspective what I really worry about is how quickly the threats are morphing and that perhaps our defenses are lagging behind. So part of what I feel very strongly is my responsibility is to make sure that DHS is resourced, that they have the tools they need and they have the authorities that they need to combat these new threats. So, for example—I’ll give you a quick one—as you know, we just received authority to address the risk of nefarious unmanned aerial vehicles in the United States. We see them real time dropping drugs and other illicit materials across the border. We see them surveilling sensitive locations. We have seen them weaponized throughout theaters of war. As close as Mexico, we’ve seen them armed with grenades. But we did not have the authority until about two weeks ago to either monitor or identify or interdict a drone that had a nefarious purpose in the United States. So I think we have to have a system that’s much more flexible. I encourage everyone at DHS to get on their toes, be really forward-leaning, double down on the threats we know today but really do that horizon scanning and think about what is emerging so that we can make sure that we’re prepared for it. So that’s my strategy, in that sense. You know, we call it relentless resilience mixed with partnership to make sure that we can cover down on all the threats we have in the homeland. SEIB: Here, and then over here next. Q: Thank you. Paula DiPerna, NTR Foundation. Thank you for being here. Back to the issue of the military. Regardless of the capacity issue and all of the threats you’ve just described, it does feel like militarization of the homeland security—militarization of our borders. And so at what point would the military, say, be authorized to shoot to kill on the border? And who would authorize that? NIELSEN: So the military—of course, I have to, you know, defer you to DOD for their rules of engagement. But the military, of course, has always been allowed—provided the opportunity to defend themselves, just as my Customs and Border Patrol agents and officers. Our rules of engagement are published online. We’re very transparent about what we do at the border and how we engage. I can’t really speak more to DOD, but our agents and officers are very clear. I would say that assaults on our officers have gone—continue to go up in some sectors. We have over eight hundred instances last year where they were attacked by those coming across the border. I do take their safety very seriously. But again, our rules of engagement are transparent and clear, and are posted online. SEIB: I think we were going there next, and then there. Q: Madam Secretary, thank you for being here. Neil Christian (sp) from Veritas Capital. When the president started talking initially about a wall, I always thought it was a metaphor for increased border security. And as time is going on, it actually seems like he’s talking about a real concrete border wall on the southern border. And I really appreciate all your eloquent responses today. I’d really love to hear whether you believe that he’s actually talking about a physical wall that’ll go up and whether that’s an effective way to protect the southern border. NIELSEN: So I think what we need is a wall system. So we need some sort of infrastructure, we need personnel, and then we need technology. And we continue to look at a whole variety of technological uses, including drones in a positive way, to make sure that we have situational awareness of that border. What I would tell you is in some of the areas at our border—and all the border areas are quite different, first of all,. I mean, some is in the middle of the desert. Some, there are natural barriers such as rivers. But some abut directly onto cities on both sides. There’s a term we use for that, which is called vanishing time. And the difficulty there is somebody can cross the border and disappear, either side, into an urban environment in a matter of minutes. So the concept of impedance and denial becomes very important. And the first and foremost way to do that is to have an infrastructure of some sort that slows them down, that gives us the opportunity to detect an illegal entry, but also hopefully deters them from attempting it to begin with if they have a legitimate need to come, go to a port of entry, and if they don’t have a legitimate need to come. Because particularly we see a lot of unfortunate traffic that way of the smugglers, of the traffickers, and the transnational criminal organizations. So I think there’s a combination. The president’s been clear we don’t need a wall from sea to shining sea. But there are some areas where that impedance and denial is the difference between being able to secure the border and not being able to secure the border. But it’s only one part. And that’s why I say we also need the personnel and technology, the sensors, the lights of the roads, the ability to apprehend, and the ability to have that situational awareness all across the border. SEIB: There and then back there. Q: Thank you. Patricia Rosenfield, Rosenfield Fund. I also want to thank you very much for this very clear and eloquent meeting. But I wanted to ask about a more perhaps conceptual concern I have, and that is the pervasiveness of fear and lack of confidence in the democratic system that we know—that seems to be such an issue that might prevent voting, as we’ve talked about, but also fear amongst the nature of the caravan, other issues that might require a stronger partnership with local community organizations, and nonprofits, foundations. You seem to have a very effective system for intergovernmental coordination, even with local-level actors internationally. I’m just wondering, how are you in the department reaching out to citizens. You said that Homeland Security is not that well understood. So I’m just wondering, how are you doing that? How are you working that? How are you reaching out to the—not the corporate but the nongovernmental nonprofit sector? And how is that working? And what could be done to make it stronger? NIELSEN: Yeah, so that is—so that is a great question. You know, as I mentioned, everything we do at DHS we have to do in partnership, because no one entity can address all these threats. I’ll give you an example on immigration. So I have personally, as have my component heads, been in very close contact with many NGOs, with foundations. We’ve asked them to be part of the conversation. We’ve brought them into various conferences we’ve had within the Northern Triangle. They play an extraordinarily important role, not just for taking care of the vulnerable populations as they travel, but also working with us in communities both for receiving those who are coming here to claim asylum, as well as for those who are being repatriated back to the countries. So the first ladies, particularly of Guatemala but Honduras as well, are very active. I, with them, also have conversations with the NGO community. We’ve asked the foundations to step up. We’ve asked them, you know, what additional role are you willing to play? How can you help us get additional resources to these populations? How can you help us message to them about the right way to do things? For example, in this particular instance, to help them understand what Mexico is offering in terms of jobs and asylum, so that we can limit the violence on those populations. So it’s a very important role. And then I could kind of go through each mission set at DHS, and the role they play. But I think more and more the communities—you know, we say hometown security. If we don’t have hometown security, we don’t have homeland security. So again, immigration is an example. I meet with the ranchers. I meet with the sheriffs. I meet with the landowners to try to understand what they’re seeing. What are their environments like? What are they concerned about? What can we do better in partnership with them to protect their constituents, as they do that every day as part of their main mission? So I think that’s crucial. I don’t know that we necessarily had leveraged that community as well as needed to in the past. So it’s a very clear focus right now, particularly with respect to the human rights situation and how we can really work with them and learn from their expertise. SEIB: So can I just ask one quick follow up? SEIB: You mentioned a couple of times your conversations with your Central American colleagues. Are they doing enough, in your estimation, to actually reduce the flow—the outflow of migrants? NIELSEN: They are—there’s a capacity issue. Nobody is really generally—has the capacity for these numbers that we’re talking about. But they’re working very hard. We’re in daily contact with all of the countries. We roll up what they’re doing. They’re trying a variety of different tactics and techniques in their communities to provide for those who would otherwise choose to leave. We have been very interested in some of the U.N. data that has come out, for example, that says that many of the migrants that make their way to the United States do so because of lack of food. And so we work with the countries to find out, well, how can we address that more systemically? And at the end of the day, it’s about building prosperity and stability in the region. So we’ve brought the private sector in. I’ve spent a lot of time talking to American companies about how and would they consider investing further in the area? We’ve been working very closely with the Overseas Private Investment Corporation to the same end. But we have to make it so that migration is not a choice, it’s not believed by anybody to be a need. So that’s, you know, ensuring that they have opportunity and what they need in the region. SEIB: Right here, and then probably this will be our last question there. Q: My name’s Phyllis Costanza and I’m with the UBS Optimus Foundation. And I think a lot of resources for foundations, coming back to your points, are being spent on rehabilitation of children who are traumatized. And what’s important is this issue of prevention, not having to put resources into rehabilitating children. So how are you working specifically with organizations like USAID and other government entities to prevent, in the first place, children from being traumatized? NIELSEN: Yeah. I mean, I think a couple different ways. The goal, as you know, with AID, is to do it in a targeted way with metrics, so that we can then scale it and expand it if something works or we can revise it and retarget it if it didn’t produce the results that we wanted. So the conversations we have with USAID and the Alliance for Prosperity in general are very much about what’s working, what’s working from the local perspective, and how can we expand that? We’ve seen some very interesting programs out of the Northern Triangle using USAID funding, for example, to have micro-competitions—business competitions. And if you win the competition, you receive $12,000, which is the—which is tied to and is the same amount in that area that you would pay a smuggler to come to the United States. So we’re trying to provide additional opportunity there as an alternative, and to help them understand that they have another alternative. But the conversation needs to continue to evolve. You know, what is the best way? What are the actual push factors in the region? And how can we—again, it’s stabilization, it’s building prosperity, economic opportunity, continuing to help them reduce violence. We’ve seen some very good-news statistics on decreases in murder rates in particular parts of the Northern Triangle. Everybody needs to do more to get those numbers down even lower. So what can we do there to help build capacity, for example, for law enforcement to help ensure that there’s a safe environment. So it’s an ongoing conversation. But I think what we’re doing is learning from the foundations who are also there on the ground, what is it that you’re seeing? And what works? And what can we be doing to help the region? SEIB: So a final question right there. Wait a second. There you go. Q: Thank you. Daniel Holtzman, Bank of America. In the 2019 budget, you’ve asked for almost a billion dollars, or a ten percent increase, 3,300 people, fifty-two thousand beds. Is—why do we still need the Army with increases like that? NIELSEN: So, as you might know, there’s a difference between requesting appropriation. We don’t have an appropriation at DHS yet. We’re still on a continuing resolution. So we are hopeful that Congress will pass an appropriation in December. The key to this issue at the end of the day is to be able to apprehend those who do not have a legal right, to detain them, and then to very quickly process them. And the expeditious processing is important because the system is so backlogged that when you have somebody who is within our country for many, many years it complicates the ability for us to remove them. They likely now have roots in the community. We don’t always have the ability to know where they are, if they failed to appear for a variety of engagements that are pre-planned, pre-designated, notices to appear to courts, et cetera. So the key is apprehending those that do not have a legal right to stay, be able to detain them, to keep them in a process with the courts that is very expeditated. And, again, I don’t mean to get into too much detail. This is extraordinary, complicated. But the detained docket goes much more quickly than the non-detained docket. So the fastest way to process through our system is to be detained. So the courts will very quickly hear your case, adjudicate it. And then the court, of course, makes the decision to deport, not DHS. The court will give us a final order of removal for a particular person, and then we seek to remove them. So it’s a little bit of apples and oranges. One is trying to address a potential massive flow that could be here in a number of days. And the other is a more systemic issue that we need to work with Congress on to address those pull factors. And, again, as I mentioned, we want to be able to keep families together. We want to be able to treat non-Mexicans the same as we treat as Mexicans. There’s different legal procedures for different nationalities right now. That adds a lot of complexity to the system. Many of who arrive at our border don’t have paperwork. So we want to make sure we do that. And then with UACs we want to—sorry, unaccompanied children—we want to make sure that we can take care of them as quickly as possible, and in the best way possible. And there’s some limits on how we can do that, with that thirteen thousand that we have now. So we’ve asked for some very specific fixes of Congress. That’s the legislative side. We have the appropriations side. But then we have the immediate potential surge right now that we’re trying to make sure we’re prepared for. SEIB: So we’ve reached the 9:00 hour. I will say you live in interesting times. (Laughter.) Thank you for coming and sharing with us today. NIELSEN: My pleasure. (Applause.) My pleasure.